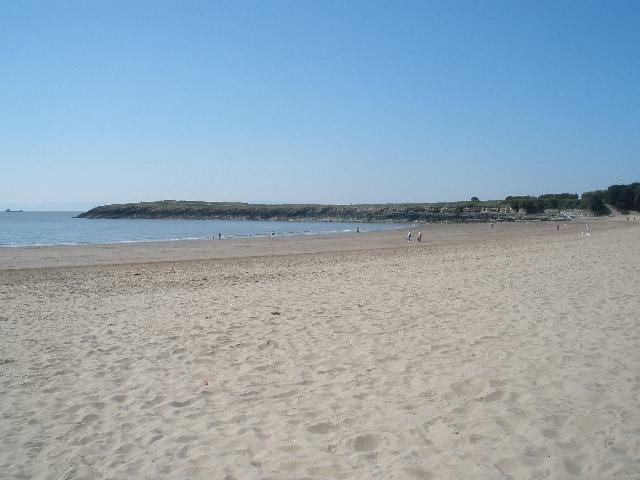 The bay is a sandy 700m cove located, west of Barry Docks and Jackson’s Bay. It faces south towards the Bristol Channel, backed by the dock area and the town of Barry. Seaside shops can be found in the immediate foreground, with limestone cliffs on either side and headlands called Friars Point to the west and Nell’s Point to the east. The water quality sample point lies at the centre of the beach. Natural Resources Wales and the Vale of Glamorgan Council have been working together to improve the bathing water quality at Whitmore Bay for a number of years. Natural Resources Wales are sharing information to develop a combined approach to resolving issues impacting the water environment. Modern sewerage systems have two separate systems, one takes foul sewage to sewage treatment, the other takes rainwater runoff through surface water drains to rivers, lakes and the sea. Misconnections occur when waste water pipes are plumbed into surface water drains instead of the foul water sewerage system. This can give rise to pollution when the waste water is discharged directly to the environment through the surface water drain. For example, a washing machine or toilet may be incorrectly plumbed so that it discharges to the surface drain rather than the foul sewage drain. Phytoplankton (microscopic algae) naturally increase in number at certain times of the year. This process is known as a phytoplankton bloom. These algal blooms can occur at any beach during the bathing season and are usually noticeable by a surface scum. This beach does not have a history of such blooms. Streams are typically affected by sewage or industrial run off from further up the catchment. Whitmore Bay bathing water quality can be impacted by the fresh water of the River Cadoxton, small streams and surface water drains, which discharge to the sea in and around the bay. These can intermittently be a source of reduced water quality, after heavy rainfall depending upon the prevailing wind and tidal conditions. Natural Resources Wales samplers make visual observations of the beach at every visit. This includes assessments of sewage debris, animal faeces, litter and oil or tar. At Whitmore Bay Barry Island, data are available for the four year assessment period from 2014-2017. Sewage debris was observed in trace amounts on less than ten per cent of occasions. Trace amounts of animal faeces were noted at the site on a minority of occasions. Trace amounts of litter were observed at the bathing water the majority of the time and in greater amounts on less than ten per cent of occasions. Oil and tarry residues were not noted at this site. Natural Resources Wales continues to work with private owners regarding potential pollution sources to the bathing water. This work involves where necessary, advisory mail drops, dye tracing, misconnection surveys and face to face meetings. Poorly maintained private sewage treatment facilities could be a source of pollution, therefore the registration of all private sewage systems in Wales is required by 30 June 2012. The primary aim of this exercise is to provide increased protection for the environment and sensitive features such as bathing water beaches. Where properties are identified in the catchment that are not on mains sewerage, Natural Resources Wales will endeavour to ensure registration has been made. The natural drainage (hydrological) catchment surrounding the bathing water is relatively flat and highly urbanised. Barry Old Harbour / Watch House Bay is located to the west and Barry Docks to the north east. The River Cadoxton meets the sea 2 kilometres east of the bay and may influence bathing water quality, depending on tidal currents and weather conditions. The River Cadoxton drains a large and diverse catchment. In the lower reaches, there is a combination of large residential areas and heavy industry, along with several small industrial estates. Towards the top of the catchment the land is largely rural, which is not intensively farmed.